Day 1 of our silver week was spent right in Tokyo itself and not far from home at all. Still trying to build up enough reserves to make the move to our own place, we spent the majority of the day looking at apartments in nearby neighborhoods. So far a couple of candidates have surfaced, but, alas, finding a good balance between greenery (is there any in Tokyo? ), moderate rent, and commute times less than 10% of your waking hours, is not an easy task. I'd be lying if I thought it was going to be. Day 2 was a chance for Hisako and I to dust off those travel ? and head south to Kamakura. Kamakura was one of the first capitals of Japan and is home to the oldest Zen temples in the country. While I've been down there to the famous big buddha and a few of the temples, I never had the the chance to vist the area called Kita Kamakura or northern Kamakura. Hisako had an itch to get down there and we scratched it. We snagged the train straight into Kita Kamakura, missing the swarms of tourists ogling over Kamakura's equivalent of the strip in Vegas where soba noodle joints stand shoulder to shoulder instead of casinos. Alighting from the train in Kita Kamakura we were greeted with a tiny station that lacks any gate and relies heavily on the good nature of travelers. A lone ticket collector stood guard near the Suica machine and collected a few tickets from from the 1% of travelers that haven't upgraded to the convenient track-me-wherever-I-go RFID cards that we all carry now. Kita Kamakura is the sleepier, yet regal family member of the two Kamakuras and home to three of five important zazen budest temples in eastern Japan. Kamakura became the seat of power in the late 12th century, for which Hisako taught me a mnemonic that all elementary school children know in Japan. i-i-ku-ni (いいくに), which translated means "good country." The mnemonic correlates the hiragana with the numerals. "i" becomes 1, "ku" becomes 9, and "ni" becomes 2. Written in kanji it would be 良い国. And I'm curious as to why the Kamakura period was thought of so fondly. Now you too can remember the start of the Kamakura period in Japan. I was most impressed with the ancient Chinese juniper trees on the walkway leading up to the main temple complex. The trunks were several meters wide, although the trees themselves are only 5 meters tall. The seedlings are said to have been brought over from China many years ago, potentially dating the trees to the 1300's. I also liked the bamboo forest that we found behind the zazen garden. The wind was coming in small gusts at the time and the stalks were busy bumping into one another and creating a lovely symphony of claves-esque sounds. The zazen garden, which many list as a must see didn't do much for me and if seeing a zazen garden is your main objective, like it was mine, you may be let down. It was probably the simplicity of the thing that got to me, but maybe that's the whole point anyway. From Kencho-ji, we began ambling towards Tsurugaoka Hachimangu, which is the main temple on a hill at the end of dankazura (the Vegas strip street). By the time we reached this temple on the hill we were getting hungry, but Hisako insisted that there were better, cheaper places to eat than on dankazura. So we headed downhill and headed to the streets running parallel to the main street. While there were plenty of options there and it was a bit cheaper than the main drag, lunches seemed to start from around 1000 yen. Not cheap in my books! Fortunately, at the place we found you got what you paid for. We both ordered ten-don (tempura on rice) and out came a big bowl of rice with a generous portion of tempura pilled on top. The tempura was excellent and the accompanying soup, pickles, and dessert were mmm, mmm, good. Although I really shouldn't compare this to KFC. The setting itself was also a bit unusual as we shared a table with several others. Back outside, we began a hike that was the highlight of my day. First we headed east from dankazura and quickly started to see the crowds thinning out. Thanks to my sister-in-laws advice, we were aiming for a small trail that skirts between a couple of temples, a graveyard, and through the woods. Back, away from the crowds, you could feel the stillness surround you and the humidity, with no means of escaping the woods, clung to us for dear life. In no time, we were sweating as we climbed over a trail where at times you could only fit one foot on to the trail as we scampered through a narrow crevice. The humidity wasn't the only thing that followed us, as mosquitoes began to hover around us. So we quickened our pace and eventually made it to the top of the hill was a deliciously refreshingly breezy and mosquito free overlook awaited us. From there we headed back downhill a bit and to the temple where you can wash your money - Zeniarai Benten. I neglected to participate in this little ceremony, but that didn't stop me from going and seeing the happy hundreds who washed everything from a few yen to 10,000 yen notes in wicker baskets in the cool mountain water. It is said that washing the money there will bring you back double. Ah, those monks and their crafty ways. To finish off the day we meandered back towards the station, grabbing a coffee at a Starbucks that included a pool you can't swim in, and a failed attempt at doing a little bit of geocaching. No surprise here, but we were both absolutely knackered and promptly our best overworked salary person routine on the train and passed out. If you've managed to read this far, I hate to disappoint, but let's not forget day 3, shopping! Shopping mainly consisted of heading back to my old haunt, Kichijoij. A mixture of necessities and clothes shopping, it didn't have all the ancient cultural lessons of the day before, but it was a great trip nevertheless. I learned that I've probably graduated from Samrat, a chain of Indian restaurants in Tokyo, actually had a great time picking out some clothes for Hisako, and always enjoy seeing a bustling metropolitan hub where you can observe history in the making instead of trying to imagine days gone by. Here's to looking forward to the remainder of the week! After an amazing start to the season and blowing everyone's socks off (except the White Sox's), they get ranked #1 in the league. It took them 7 weeks to get there and then 7 weeks later after that #1 ranking to reverse the trend completely. 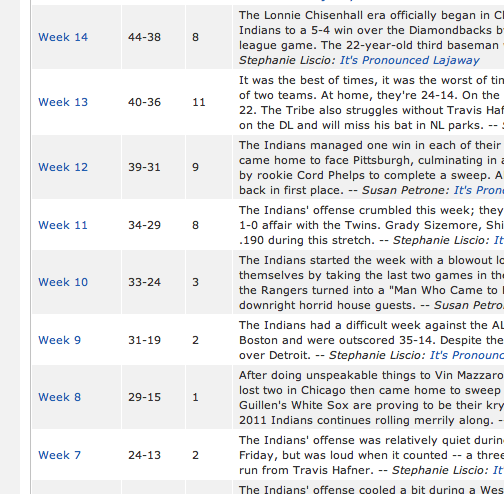 How I love being a Cleveland sports fan.